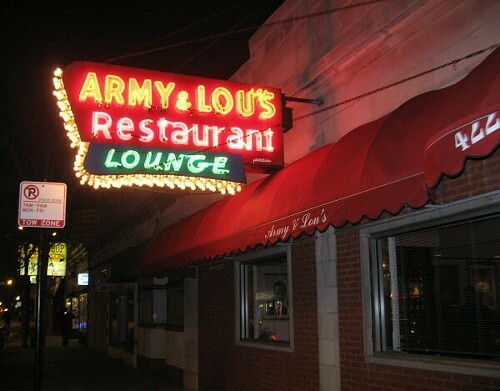 The late, great Army & Lou's is making a comeback, says Grubstreet. If one more venerable soul food spot rises from the dead, it's a trend. C'mon Izola's! More notable food news, and other ramblings, after the jump. Ellen Malloy made a CAFO mom cry yesterday. Is the Michigan DNR trying to prohibit heritage swine breeds? The Farm-to-Consumer Legal Defense Fund is worried. The great Italian sundries and sandwich shop J.P. Graziano expands its hours. Dale Levitski's Frog & Snail: open for lunch. Phillip Foss gets snacky at El Ideas. Oh no—we're losing a Top Cheftstant! Yay—we're gaining a Top Cheftestant!